p. 196 - I made a quick version of this recipe using leftover steamed rice (from my Zoji) I also opted for canned beans since it was a weeknight w no time to soak the dry. This turned out great. Nothing earth-shattering, just a nicely seasoned simple rice dish. I used 2 serrano chilis which warmed the dish to perfection for our tastes. I'd definitely make this again and would likely use canned beans. Cilantro and chiles, mole and salsa, succulent sweet shrimp and red snapper, zesty tacos, nachos, and quesadillas--no cuisine in the world is more fun than that of Mexico. 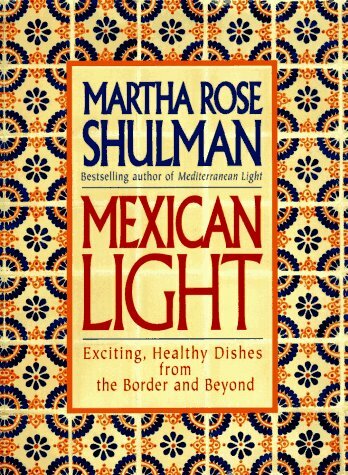 In Mexican Light, first published in hardcover in 1996, Martha Rose Shulman takes the fat out of America's favorite good-time food, creating mouthwatering and healthy adaptations of Mexican classics. Mexican Light lets you eat all the irresistible foods from south of the border without any of the guilt. Savor creamy Chipotle Dip; luscious Refried Black Beans with Plantain Pancakes; delicious Soft Tacos with Chicken, Corn, and Avocado; smoky Pan-Cooked Salmon Fillets with Tomatillo Salsa; and homey Green Hominy Stew with Chicken. Desserts include delectable fruits and ices, and traditional Mexican rice pudding and flan, adapted for lower fat content. Even snacks are healthier versions of our favorite indulgences: crisp nachos and toppings, soft tacos, green enchiladas, and fabulous quesadillas with wild mushrooms and smoked jalapenos. Each recipe is accompanied by a complete nutritional breakdown, including calories, sodium, and fat. Mexican Light captures the essence of one of the world's greatest cuisines in healthful versions so good you'll never miss the fat!